Side note: I also noticed the other night that the gang had set up all the chairs out in front of Zoka, which is basically right next to the Tobacco Patch. I'll be very curious to see how this all pans out - hopefully no one will complain, again! 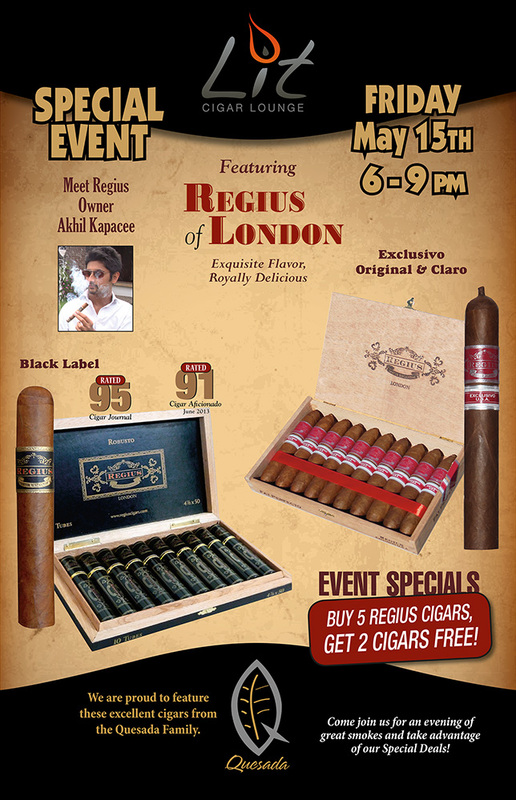 This Friday, May 15th in Lit from 6-8pm, we'll be joined by the owner of Regius Cigars, Akhil Kapacee as we feature two of his best blends, the Regius Black Label and the brand new Regius Exclusivo USA. We'll also have four great beers from Georgetown Brewing Co. available at this event, including one keg of Bob's Brown Ale. 100% of the proceeds from Bob's are donated in honor of Charles "Bob" Hirsch to the Ronald McDonald House Charities of Western Washington and Alaska to provide a "home away from home" for Children's Hospital patients and families. Last year, Georgetown raised over $100,000 for this charity through the sale of Bob's! If you haven't tried a glass of the Georgetown Oharov Imperial Russian Stout aged in our own Woodford Reserve Bourbon barrel, this would be a great chance before we run out! 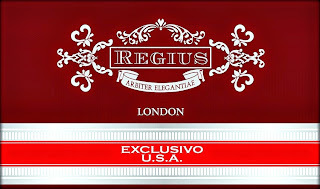 Hope to see you on Friday May 15th for some of the best cigars and beers in the world! We mistakenly announced this event occurring on May 17th in a previous newsletter. Thanks to our sharp eyed readers for pointing out this mistake. 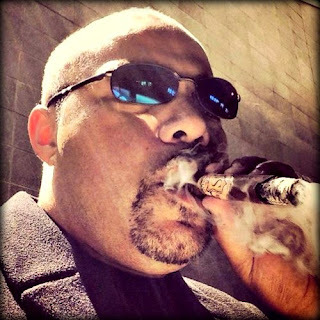 Join us on Thursday, May 28 from 6-9pm outdoors in the Mountain View Plaza for a special Tiki inspired Summer kickoff event featuring Jose "Hurricane" Ortega of My Father Cigars! We'll have some great Tiki inspired cocktails from Reyka Vodka, Sailor Jerry Rum and Monkey Shoulder scotch whisky as well as event specials on My Father Cigars. This event is free to attend and will be moved inside to Lit in the event of inclement weather. 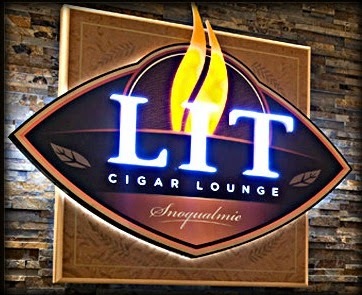 Don't miss your chance to be the first to try our Lit Summer Tiki cocktails, meet Jose and get some great deals on award winning brands such as My Father, Flor de las Antillas and La Antiguedad! 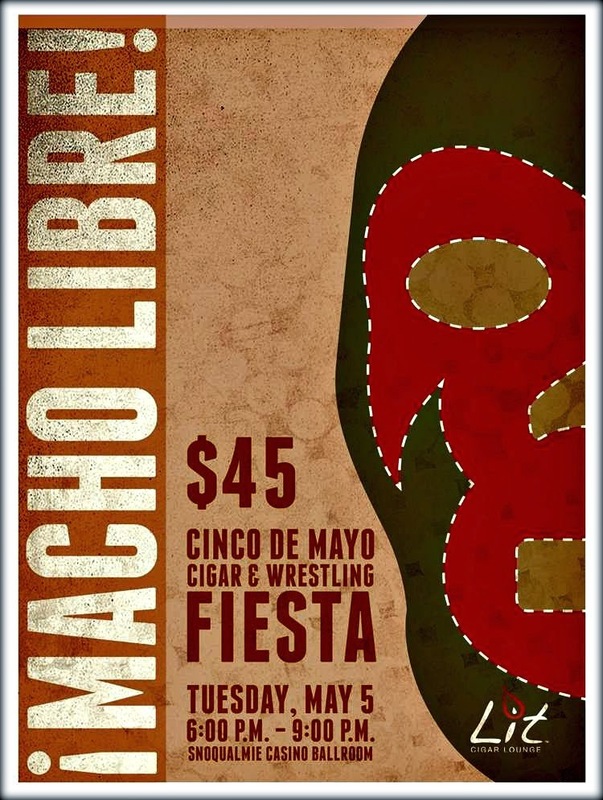 A special thank you to all who attended last week's Macho Libre Cinco de Mayo event! We had a blast and hope to be able to do this one again next year. If you haven't purchased your tickets for¡Macho Libre!, our upcoming Cinco de Mayo event, there's still time! Tonight, we'll be taking over the Snoqualmie Casino Ballroom for a one-of-a-kind event of Lucha Libre wrestling, cigars, tequila and cerveza! 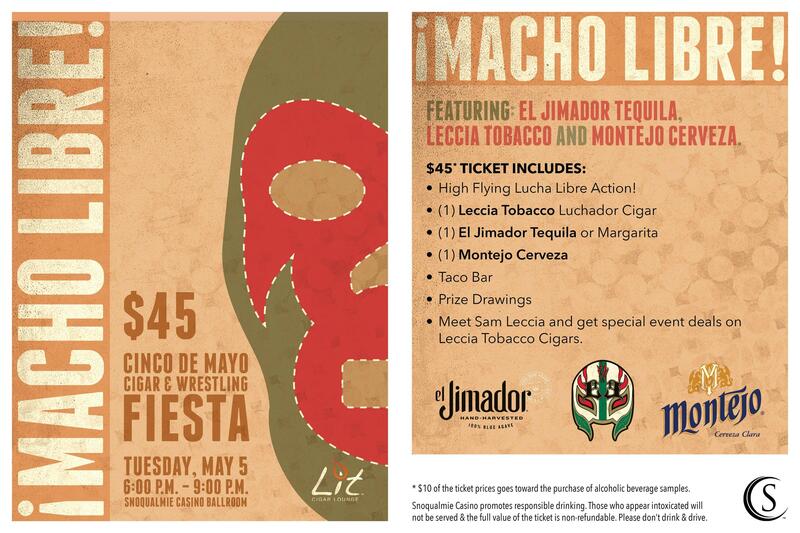 Your $45 tickets includes a high flying wrestling performance, cigar, tequila or margarita, cerveza and taco bar! We'll also have some great prize giveaways as well! The doors open at 6pm, but the wrestling show doesn't begin until 7pm, in case you're worried you can't make it up here in time. Forward this email to your friends and get up here for what is sure to be the coolest cigar event and craziest Cinco de Mayo party of the year! 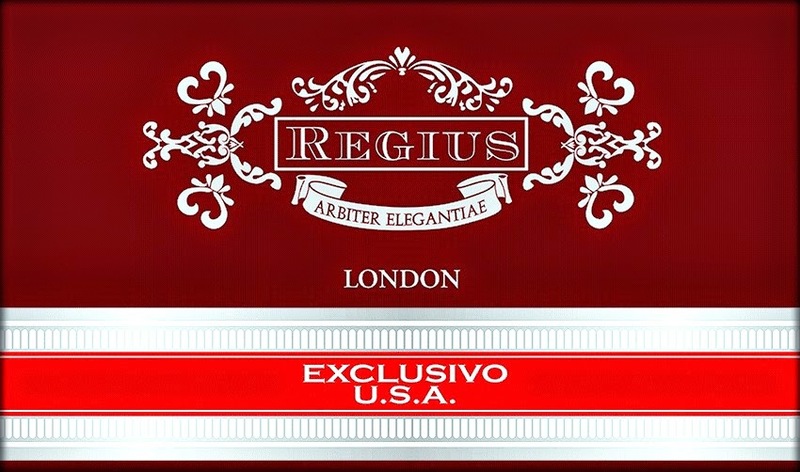 On Friday, May 17th, 6pm-8pm, in the Lit, we'll be joined by the owner of Regius Cigars, Akhil Kapacee as we feature two of his best blends, the Regius Black Label and the brand new Regius Exclusivo USA. 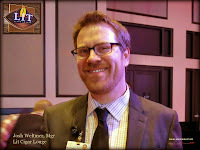 Hope to see you on Friday May 17th for some of the best cigars and beers in the world!